The satellite successfully launched Sunday — known as GPS 3 SV01 and nicknamed “Vespucci” after Italian explorer Amerigo Vespucci — is the first in a new generation of GPS navigation stations designed with improved services and longer lifetimes to ensure the U.S. military-run network remains available to troops, pilots, sailors and the public for decades to come. The 229-foot-tall Falcon 9 launcher lifted off from Cape Canaveral’s Complex 40 launch pad at 8:51 a.m. EST (1351 GMT) Sunday after multiple delays over the last five days, including countdowns halted by SpaceX to investigate sensor trouble in the rocket’s first stage and by poor weather at the Florida spaceport. But Sunday’s countdown appeared to go by the book, and SpaceX’s launch team gave approval to load super-chilled kerosene and liquid oxygen propellants into the two-stage rocket around 35 minutes before liftoff. In the final minutes of the countdown, the GPS satellite inside the Falcon 9’s nose cone was switched to internal battery power, and the rocket’s automated countdown sequencer computer thermally conditioned the booster’s main engines, completed a final preflight steering check and pressurized the propellant tanks for liftoff. With a command from the Falcon 9’s on-board computer at T-minus 3 seconds, nine Merlin 1D engines flashed to life at the base of the rocket and powered the Falcon 9 into a clear morning sky for a thundering holiday weekend departure that marked the latest launch from Cape Canaveral in a calendar year since 1995. “Merry Christmas, GPS,” a member of SpaceX’s launch team announced at liftoff. The Falcon 9 flew northeast from Florida’s Space Coast, propelled by 1.7 million pounds of thrust in the first stage’s burn lasting nearly three minutes. The kerosene-fueled booster shut down and detached to drop into the Atlantic Ocean, as the second stage’s single Merlin engine fired up for the first of two burns to inject the newest GPS navigation satellite its targeted orbit. Unlike SpaceX’s most recent missions, the first stage did not attempt a landing on Sunday’s flight because the GPS payload required the full capability of the rocket, leaving no fuel reserve for the booster to return to the ground intact. The Air Force decided to add extra fuel to give the spacecraft added “resiliency” and potentially a longer lifetime, and the military requires rockets carry national security satellites to de-orbit their spent upper stages if possible. Those requirements added up to the Falcon 9 needing to commit more of its propellant to the primary mission with the GPS satellite. Read our earlier story for details on why SpaceX did not recover the first stage Sunday. Air Force officials told reporters earlier this month that later Falcon 9 launches with GPS satellites might include first stage landings, but managers would not commit to such a decision before evaluating the rocket’s performance on Sunday’s mission. 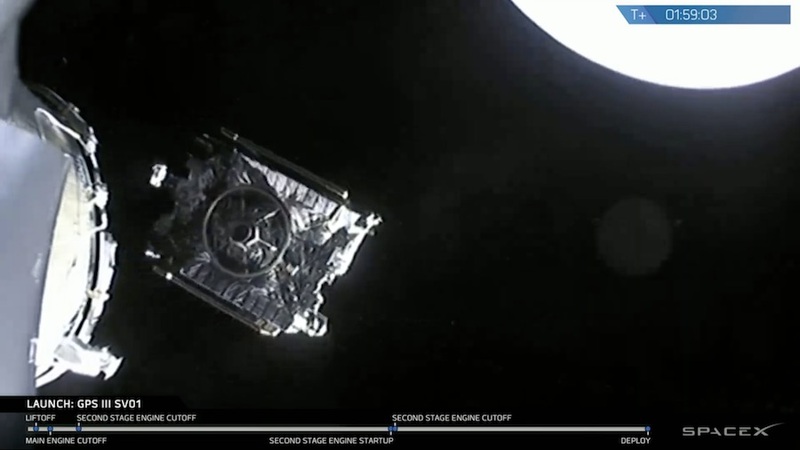 SpaceX’s provided live on-board camera views from the upper stage as it climbed away from Earth, showing the curvature of the planet’s horizon against the blackness of space before the GPS 3 SV01 satellite separated nearly two hours after liftoff at an altitude of more than 5,400 miles (8,700 kilometers). 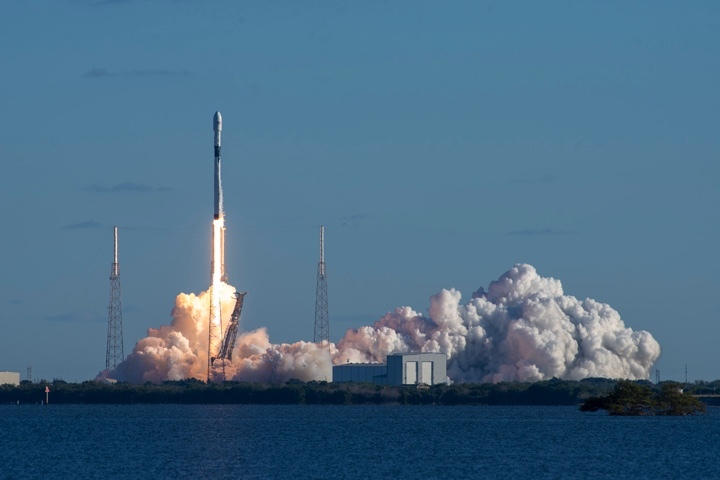 “Launch is always a monumental event, and especially so since this is the first GPS satellite of its generation launched on SpaceX’s first national security space mission,” said Lt. Gen. John Thompson, commander of the Air Force’s Space and Missile Systems Center and the Air Force’s program executive officer for space. “As more GPS 3 satellites join the constellation, it will bring better service at a lower cost to a technology that is now fully woven into the fabric of any modern civilization. “It keeps GPS the gold standard for positioning, navigation, and timing information, giving assured access when and where it matters. This event was a capstone, but it doesn’t mean we’re done. We’re going to run a series of procedures for checkout and test to ensure everything on Vespucci functions as it was designed,” Thompson said in a statement. U.S. military tracking data indicated the Falcon 9 placed the new GPS satellite in an orbit ranging between 740 miles (1,191 kilometers) and 12,550 miles (20,198 kilometers) in altitude, with an orbit inclined 55 degrees to the equatorial plane. Those numbers were right on target for the launch, SpaceX’s first with a major U.S. national security payload, a milestone in the company’s years-long effort to gain traction in the military launch market. The Air Force certified the Falcon 9 rocket for national security space launches in 2015 after extensive reviews of the vehicle’s design, reliability and performance, a multi-year process instigated, in part, by legal challenges by SpaceX founder Elon Musk to the Air Force’s sole-source contracting arrangement with ULA. SpaceX’s Falcon Heavy rocket was certified by the Air Force earlier this year, in the wake of the heavy-lifter’s first test flight in February. The Air Force has already awarded one national security launch contract to the Falcon Heavy since it became eligible for such missions, while ULA has won three new launch contracts in the military’s new era of competitive launch procurements. ULA’s Delta 4 rocket is slated to launch the second GPS 3-series spacecraft — nicknamed “Magellan” — next summer, an Air Force spokesperson told Spaceflight Now last week. 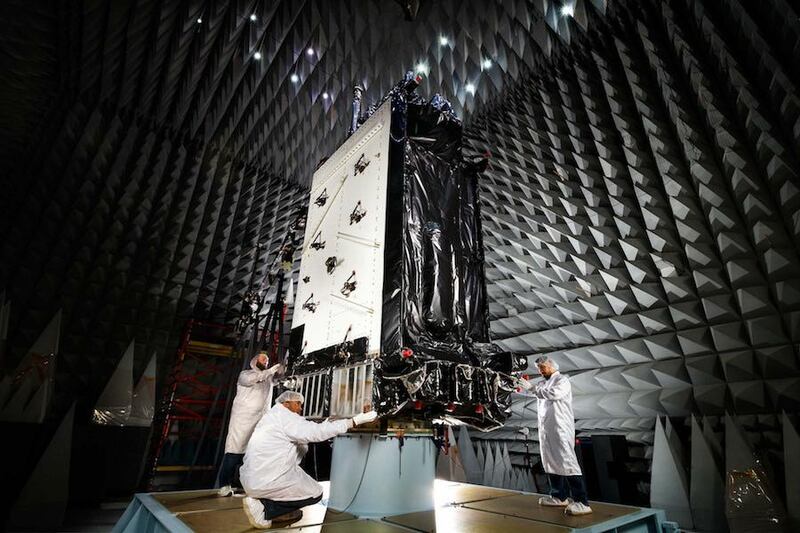 That is a few months later than the previously-planned launch date in April, a slip industry sources said is due to the Air Force’s preference to complete testing of GPS 3 SV01 in space before committing to launching the second GPS 3 model. The launch of the GPS 3 SV02 satellite next year will mark the final flight of the Delta 4’s basic “single stick” configuration. ULA is retiring the smaller variants of the Delta 4 — but keeping the triple-body Delta 4-Heavy in service — and focusing flights in the next few years on the less expensive Atlas 5 rocket, while developing the next-generation Vulcan launcher with reusable Blue Origin BE-4 engines, which could eventually be retrieved and refurbished. 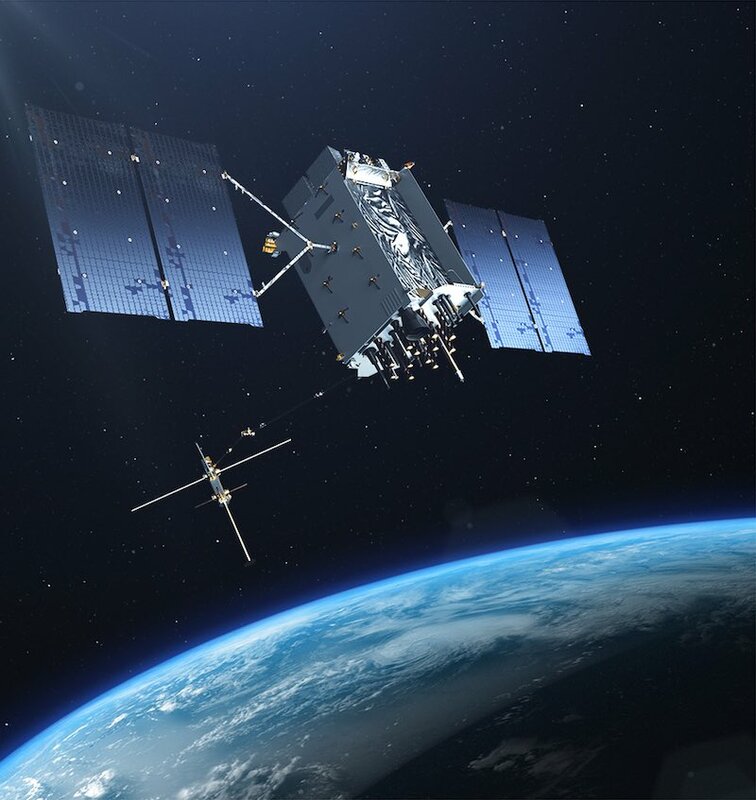 The third GPS 3-series spacecraft — christened “Columbus” — is assigned to fly on a Falcon 9 rocket from Cape Canaveral in December 2019, the Air Force said. Subsequent GPS launches are planned at intervals of as short as four-and-a-half months, but officials will decide on a launch schedule based on the needs and health of the overall GPS network, according to an Air Force spokesperson. 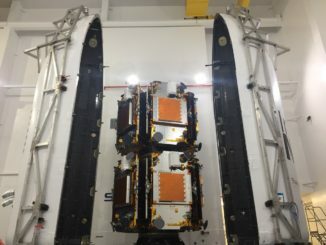 Air Force officials said some of the GPS satellites could launch on Falcon 9 rockets with previously-flown boosters, which commercial satellite owners and NASA have used to receive bargains on launch costs. Flying with previously-used rockets also helps ease burdens on SpaceX’s manufacturing line and supply chain. Lockheed Martin said after Sunday’s launch that ground controllers at the company’s launch and checkout facility in Denver established contact with the GPS 3 SV01 satellite to begin putting the craft through in-orbit testing that could last more than a year. 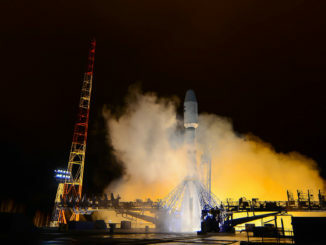 The GPS 3 SV01 spacecraft is set to reach a circular orbit at the GPS fleet’s altitude around 10 days after launch, Whitney said. Seven firings by the satellite’s liquid-fueled main engine are planned to circularize the craft’s orbit at an altitude of 12,550 miles, followed by deployments of the satellite’s solar arrays and antennas. Once it joins the rest of the GPS constellation, the new satellite will undergo six-to-nine months of checkouts to verify the health of key spacecraft systems, and test the functionality of its navigation instrumentation provided by Harris Corp. Another testing phase to validate the new GPS satellite’s compatibility with the rest of the navigation network will take an additional six-to-nine months, according to Col. Steve Whitney, director of the Global Positioning Systems Directorate at the Air Force’s Space and Missile Systems Center. The GPS network currently provides users with position estimates with an accuracy of around 50 centimeters, or about 20 inches, Whitney said, assuming receivers are not contending with terrain, trees, or buildings. The last spacecraft in the previous series of Boeing-made GPS spacecraft launched in 2016, and Whitney said the GPS fleet “remains healthy, stable and robust” with 31 active satellites. With the GPS launch Sunday, SpaceX closed out 2018 with its 21st successful flight of the year, breaking a record for the company’s highest annual launch rate previously set last year with 18. The launches this year included six missions from Vandenberg Air Force Base in California, and 15 from Florida’s Space Coast — 12 from pad 40 at Cape Canaveral Air Force Station and three from nearby pad 39A at NASA’s Kennedy Space Center. A highlight of the year for SpaceX was the maiden test flight of the Falcon Heavy rocket, made by combining three Falcon 9 rocket boosters together to generate more than 5 million pounds of thrust. The Falcon Heavy’s debut Feb. 6 sent a Tesla Roadster from Musk’s collection into the solar system on a trajectory that reaches further from the sun than the orbit of Mars. SpaceX launched three resupply missions to the International Space Station, three missions carrying Iridium communications satellites into orbit, and eight flights with geostationary communications payloads. Other missions in 2018 launched NASA’s Transiting Exoplanet Survey Satellite — an observatory built to detect planets around other stars — and Earth observation satellites for Spain and Argentina. SpaceX plans around 18 launches next year, according to Hans Koenigsmann, the company’s vice president of build and flight reliability. Big launches next year include the first two test flights of SpaceX’s Crew Dragon human-rated capsule, with astronauts set to ride the spacecraft to the International Space Station as soon as mid-2019. 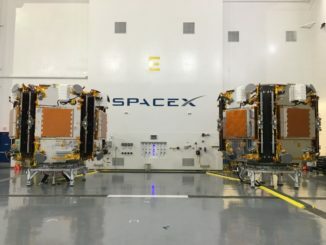 The company’s 2019 launch schedule is set to begin Jan. 7 with the launch of a Falcon 9 rocket and a batch of 10 next-generation Iridium voice and data relay satellites from Vandenberg Air Force Base, California.